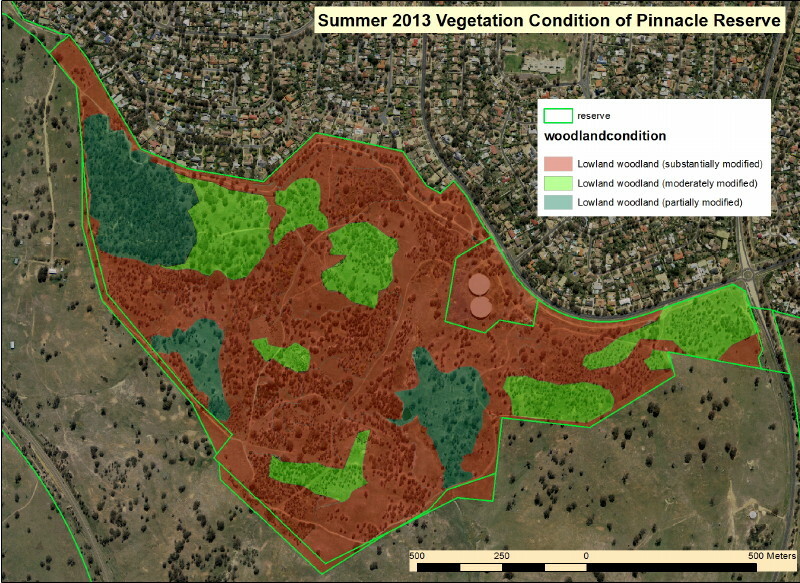 Towards the end of 2013 the Conservation Planning and Research, Natural Policy Branch of ACT Environment and Sustainable Development carried out a survey of rare plants and vegetation condition across the Canberra Nature Park. At The Pinnacle Nature Reserve, this was carried out in conjunction with members of fotpin. 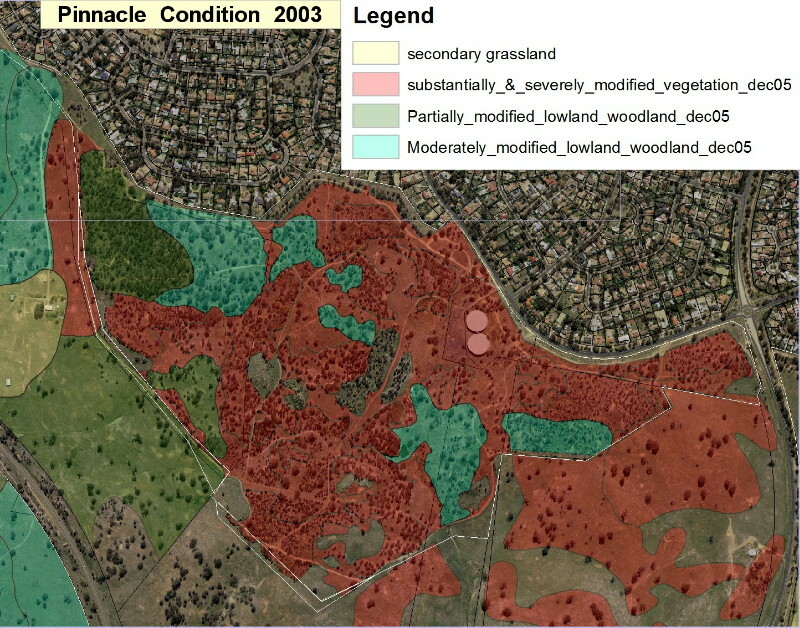 The mapping of rare plants (based on the recently revised list of plant species proposed for protection) will assist both in determining appropriate management for individual reserves, and for providing the Canberra lowlands wide context against which the significance of an occurrence of a particular plant within an individual reserve can be assessed. The survey of vegetation condition followed the methodology of the mapping undertaken around 2002-2003 for the Lowland Woodland Action Plan. This re-survey provides a measure of the condition change in woodland over the last decade or so. It can provide a fairly reliable indicator as to whether vegetation condition within Canberra Nature Park is improving or deteriorating. Understanding of these changes can inform future management direction and priorities. A total of seven rare plant species were located on The Pinnacle Nature Reserve, with occurrences ranging from a single location to more than 20. We hope that knowing of their existence and location will add an extra level of care and protection when hazard reduction burns are carried out in these areas. Substantially modified: low to very low diversity of native species, mainly disturbance tolerant native grasses, and usually a high cover of exotic perennial and annual species. In summary there has been a 10ha conversion over the last ten years of vegetation in a substantially modified state to that of a moderate or partially modified state – which is a pretty good result, and even better in that much of the mapped moderate vegetation is at the upper end of that vegetation condition. The only vegetation on the Pinnacle that is in a worse state than it was 10 years ago is that within the inner asset protection zone around the tanks.